So my office, currently the kitchen table at the vacation rental house on the property, has a view of our 600 olive trees and the rest of the land where they reside. Almost 4 weeks ago, we had a winter storm of sorts with negative temperatures (C) and hurricane style winds. We lost power and water for 4 days and the temperature of our house dropped below freezing. After a week of wearing my ski clothes everyday, going to bed in my sleeping bag underneath the down comforter and allowing both dogs on the bed, I had had enough. The vacation property next door has gas powered heaters and much lower ceilings, so we moved and have been here for 2 weeks now. 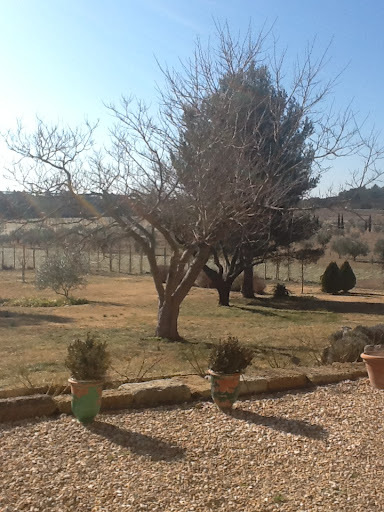 This week the sun has been shining as it should(because that’s why we all live in ‘sunny provence’) and the temps have finally been reaching 13C & 14C. People are out and about a bit more and you can tell Spring will be here soon. When I am not working from the kitchen table at the mas, or the desk in my own house, I head out to a cafe to talk business with friends. Yesterday I met with Hilary who runs a company called Wine in Provence. She had a special surprise prepared for me…A VENDOR LIST! It’s not long, it’s mostly people in Aix, but I will add them into the mix…block by block. She also gave me some great insight into my business from what she has learned the past 4 years with her own. The critical piece of information was that lots of people contact her about doing their wedding in provence. Why do they contact her when she runs a wine tasting business? Because it’s the only site they can find in english for our area. I am at a crossroads and all paths lead to destination weddings. It’s time too reengineer the website a bit and cast the net a bit wider. If I can produce events for 10’s of thousands of people, then I can certainly do a few weddings a year…mostly in my own backyard. Did I forget to mention that? Many of my brides will get married right here at the house and my home office will become the event site. Now that is a good trick.